take I-79 south to Weston (exit 99). Take rt. 33 east to Elkins. Continue on 33 east for 18 miles to cr-3 (Rich Mtn Rd). Turn right and go 1.7 miles to Job and then on cr-29 (Whitmer Rd) for 15 miles. There are 7 trailheads along this road starting at 1 mile south of Whitmer. At the end of cr-29, go left (east) on FR1 and FR112 past Spruce Knob Lake CG. Three more trailheads are on your left. Continue on to Spruce Knob where is another trailhead. 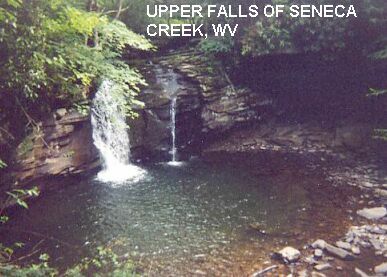 UPPER FALLS OF SENECA CREEK [UPPER]: Hike about 5 miles to the Upper Falls of Seneca Creek. A 12-15 feet high falls drops into equally deep pool of emerald green (cold) water. No fee. Unofficial site. Bathing suits unknown. PHOTO. LAT, LON lat=38.77175, lon=-79.50828(source: DeLorme) (accuracy:approximate) LINK TO GOOGLE MAP. To get here: you could continue hiking up Seneca Creek from the Falls of Seneca but it is a long way. A better way is, from the Seneca Rock visitors center, go south on RT 33/28 to Riverton then 2 miles more to turn right (west) on CR 33-4. Continue onto FR 112. Follow FR 112 to Spruce Knob then 6 miles more and park at the Seneca Creek trailhead. SENECA BACKCOUNTRY TRAILS MAP. Hike north on this trail about 5 miles to the Upper Falls of Seneca Creek. Very confident. Not verified. Updated 2/4/2003.